Hot pink, shocking turquoise or kelley green….leather is not just for the your fathers library chair anymore! “Leather”, I put it in quotation marks because I really mean the fake stuff, is the embodiment of Family Style. I love it because it instantly infuses even a traditional space with a youthful vibe. I also love it because spills, smudge and drool wipe right off!. My obsession right now is this fabulous cream croc wallpaper from Stark that I am using on the walls in a very elegant, traditional and antique laden living room. (the trim is painted farrow and ball full glass lacquer in the same cream, a stunning combo!) I also love pleather on breakfast room banquettes and any dining chair. Or as the ultimate room topper, leather papered on the ceiling adds a subtle hint of texture that can be sublime! Here of some of my favorites! 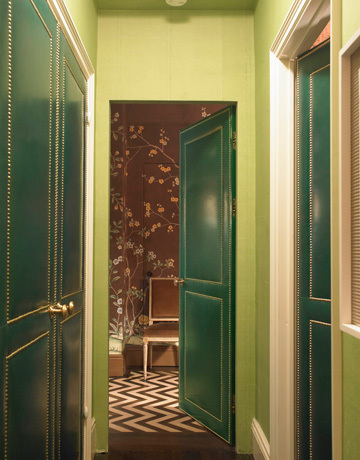 Love the leather upholstered doors…why not! Sumptuous pink leather for this elegant eating perch. This breakfast table can stand up to strawberry pop tarts! Oh, by the way, check me out in the Paint section of House Beautiful this month!